Other names: Apple dumpling, common appleberry, snotberry. Appleberry is a fruit from Australia. The plant is a hardy climber. 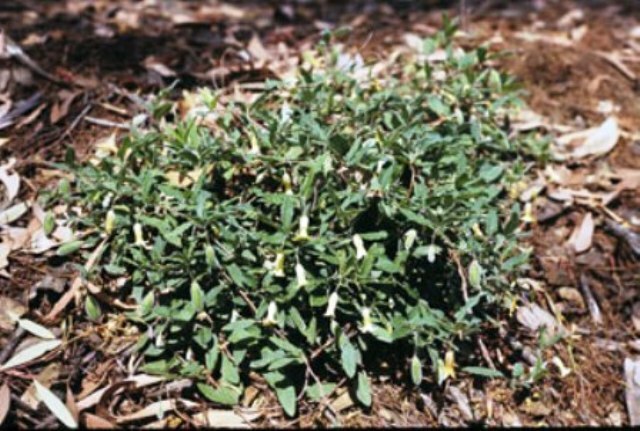 It is a common species that grows there in habitats as diverse as cool sheltered gullies to mallee scrub, from Tasmania, Victoria, and South Australia, through to New South Wales and Queensland. Now this plant is planted in gardens in many parts of the world. 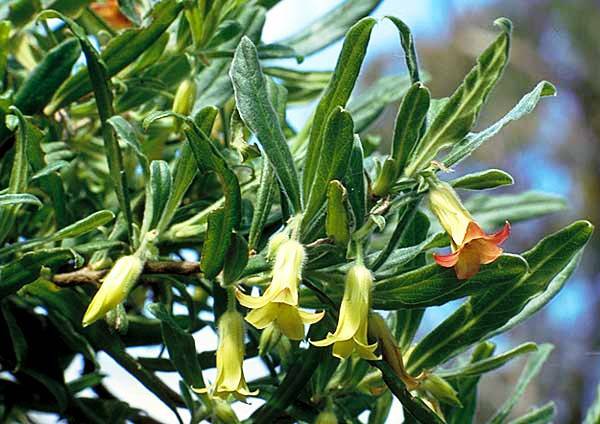 An evergreen sprawling groundcover or climber, with wiry, red to brown-grey stems up to 3 metres long. In an open position the form may take that of a small shrub to 1.5 m high. The shoot tips are very hairy, with a fine white fringe. Leaves, hairy, narrowly oval, mid green, 0.5 cm wide and 5 cm long. The leaves have a wavy, sometimes recurved margin. The underside of the leaf is pale-green and silky. Flowers pendulous, bell-shaped, developing on the end of stems or on short branchlets in spring and summer. These 1-2 cm long flowers are borne on slender stalks, singly or in groups of 2-3. Each flower has five bright yellow-cream petals that tinge with purple as the flower ages. The petal tips reflex as the flower opens. Fruit an oblong berry, 2 cm long and 1 cm wide forms in summer. The fleshy green and purple fruit turns yellow when ripe. 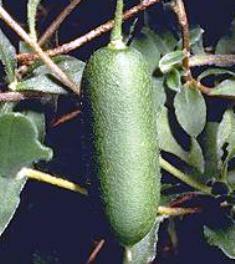 The skin is hairy and similar to peach and the sweet astringent flavour similar to kiwifruit. Fruits of Appleberry are edible. These are fondly eaten by Australian Aborigines as well as the new settlers. However, the fruits do not ripen on tree but only after falling down from the trees. The fruits are then collected and induced to ripen. Ripe fruits have a pleasant sub-acid taste similar to stewed apples or kiwifruits. Unripe fruits are roasted and eaten. Appleberry fruits are valued as Australian bush food. Appleberry requires a moist, well-drained, humus-rich, lime-free soil in sun or semi-shade with a cool root run. They tolerate temperatures down to at least -7° C in Australian gardens. But if it has to be grown in Britain, it will require greenhouse protection during winter months. This plant is easily propagated by seed. It can also be multiplied by cuttings of half-ripe wood. The cuttings should be 10-12 cm long and preferably with a heel. The cuttings are planted in July-August. Layering is also feasible. Appleberry is a hardy climber that will grow in full sun to dense shade and in sandy to clay soils. It’s even possible to establish this plant underneath established eucalypts, as long as they are given a little extra fertilizer. Due these characteristics, Appleberry soon gained popularity where ever it was introduced as a garden plant.